"Who can find a virtuous woman? for her price is far above rubies. The heart of her husband doth safely trust in her, so that he shall have no need of spoil. She will do him good and not evil all the days of her life. She stretcheth out her hand to the poor; yea, she reacheth forth her hands to the needy." Emma Hale Smith Bidamon was born on July 10, 1804, to Isaac and Elizabeth Hale. She grew up in Harmony, Pennsylvania, along the banks of the Susquehanna River on a 13 acre farm. She attended school, and was well educated for a girl of that day. She met Joseph while he and his father were boarding at her father's house in 1827. It must have been love at first sight because they eloped and were married on January 18th of that same year. Joseph shared his stories about the First Vision, the Angel Moroni and the gold plates with her. She trusted and believed him. She was with him the night he was finally allowed to take the plates. She saw him walking down the hill with a large bundle in his arms wrapped in cloth, making her the first person, other than Joseph, to see evidence of the reality of the plates, without actually seeing them. Emma's father had not approved of their marriage, refusing give his blessing to their union. Despite the tensions between her parents and Joseph, Mr. Hale consented for them to move back into Emma's childhood home in Pennsylvania when the torment and harassment in Palmyra grew too intense. There, Emma and Oliver Cowdery helped Joseph with the translation of the Book of Mormon. They remained there until it became necessary to relocate again. By invitation of the Whitmer Family, they moved themselves and the plates to Fayette, New York. It was also there, along the banks of the Susquehanna River, that the Priesthood was restored. After she and Joseph moved with the Church to Kirtland, she never saw her parents again. And was never able to reconcile Joseph and her father. On April 30, 1831, three months after moving to Kirtland, Emma gave birth to twins, both of whom died within hours of being born. Nearby, a friend, Julia Clapp Murdock, wife of John Murdock, died after also giving birth to twins. Murdock, fearing he wouldn't be able to provide for the children alone, asked Emma and Joseph to raise the twins as their own. They took the newborns in and named them Joseph and Julia. Emma enjoyed many blessings and also faced extreme hardships during their time in Kirtland. She saw the growth of the church and contributed to the building of the Kirtland Temple, and completed the first edition of the hymnal as she had been commanded to do in a revelation given to Joseph in 1830. She also witnessed her husband endure physical violence. In 1832, she watched Joseph dragged out of bed by a mob in the middle of the night and get tarred and feathered. At first she thought the tar was blood and that he was near death. Five days later, her adopted son, Joseph, died from exposure to the cold as a result of the mob. She and Joseph would suffer the loss of more children in the future. Out of their 11 children, including the 2 that were adopted, only 5 would live to adulthood. She also saw some of Joseph's closest friends turn on him during the struggles in Kirtland, and was always his strongest defender. In 1838, Emma, Joseph and their three remaining children fled with the Church from Ohio to Far West, Missouri. Missourians, however, continued to resist what they saw an the LDS invasion. Growing resentment and bitterness about the Church's increasing political power, Joseph's anti slavery statements, and religious bigotry erupted into widespread violence and lead to the now infamous Mormon Extermination Order. Joseph and other church leadership were captured and imprisoned in Liberty, Missouri. Meanwhile, Emma was helping the Mormons evacuate to Illinois. With two babies in her arms and two at her skirts, Emma walked across Missouri and crossed the frozen Mississippi River to refuge in Quincy, Illinois. She also brought with her the manuscript of her husband's translation of the Bible hidden in pockets in her clothing. She wrote to Joseph in jail about the trials she had endured, but vowed that she was "yet willing to suffer more if it is the will of kind heaven". After Joseph and Emma were reunited in Nauvoo, she continued to support Joseph in his role as prophet and helped to support the church. In 1842, Emma was elected as the first president of the newly organized Relief Society, the women's auxiliary organization in the church. As president, Emma counseled the women on the charitable mission of the Relief Society and how they would "come in possession of the privileges, blessings, and gifts" associated with the priesthood. Emma pressed for vigilance in watching over the morals of the community and diligence in succoring the poor. She saw the organization grow from a charter membership of twenty women to more than 1,100 at the end of the first year. Emma stood by Joseph through the organization of the church; through his bogus arrests; through the loss of multiple children; through moving from state to state; through mobs, violence, and forced expulsions; even through the revelation on plural marriage. She loved and sustained him right up until the end when Joseph was murdered in Carthage. Like I said, it must have been love at first sight because the two of them went through hell and back and still adored each other. The poor woman was pregnant at the time of Joseph was martyred in Carthage, Illinois in June 1844. 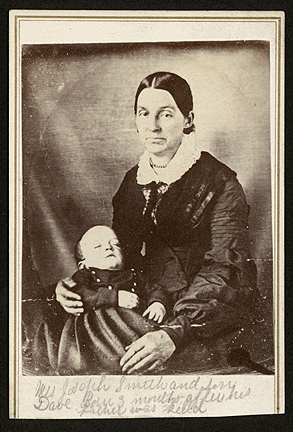 She delivered their youngest son, David Hyrum, 5 months after Joseph's death. Emma remained in Nauvoo, Ill. with her children and Joseph's Mother after Joseph's death, instead of moving with the rest of the church to the Salt Lake Valley. She had major disagreements with Brigham Young over church policy, finances, and certain practices, namely polygamy. On December 23, 1847, almost 3 and a half years after the death of Joseph, she remarried to a nonMormon named Major Lewis C. Bidamon. Major Bidamon had been Abraham Lincoln's commanding officer in the Black Hawk Indian War. In her later years the only contact she had with the church were old friends who would stop by when they traveled through Illinois, or when her sons were campaigning against polygamy. 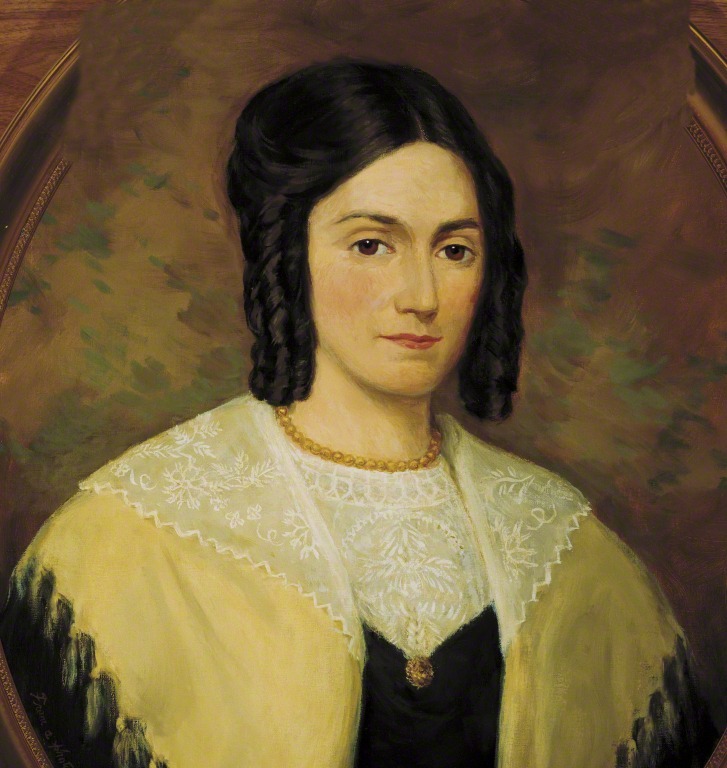 On April 30, 1879, a few months before her death, her son Joseph Smith III, (then the head of a new Reorganized church, now called Community of Christ), interviewed her about the events of the restoration one last time. He thought it important to have her testimony on record. The following are excerpts from the transcript of that interview. Keep in mind, she was 76 years old and it had been 50 years since she had helped pen the translation of the Book of Mormon. Her final account gives some details about how the plates were translated, and why it wasn't possible for Joseph to have made up the book. I also find her account amazing because she describes the plates the same way the Eight Witnesses did so many years after the fact. This would be highly unlikely if they had all been making the story up, nearly impossible since she hadn't had contact with any of the witnesses in some time. Question. What of the truth of Mormonism? Answer. Joseph Smith [and for the first time she used his name direct, having usually used the words, "your father" or "my husband"] could neither write nor dictate a coherent and well-worded letter, let alone dictate a book like the Book of Mormon. And, though I was an active participant in the scenes that transpired, and was present during the translation of the plates, and had cognizance of things as they transpired, it is marvelous to me, "a marvel and a wonder," as much so as to anyone else. Question. I should suppose that you would have uncovered the plates and examined them? Answer. I do not think he did. I knew that he had them, and was not specially curious about them. I moved them from place to place on the table, as it was necessary in doing my work. Question. Mother, what is your belief about the authenticity, or origin, of the Book of Mormon? Answer. My belief is that the Book of Mormon is of divine authenticity - I have not the slightest doubt of it. I am satisfied that no man could have dictated the writing of the manuscripts unless he was inspired; for, when acting as his scribe, your father would dictate to me hour after hour; and when returning after meals, or after interruptions, he could at once begin where he had left off, without either seeing the manuscript or having any portion of it read to him. This was a usual thing for him to do. It would have been improbable that a learned man could do this; and, for one so ignorant and unlearned as he was, it was simply impossible.